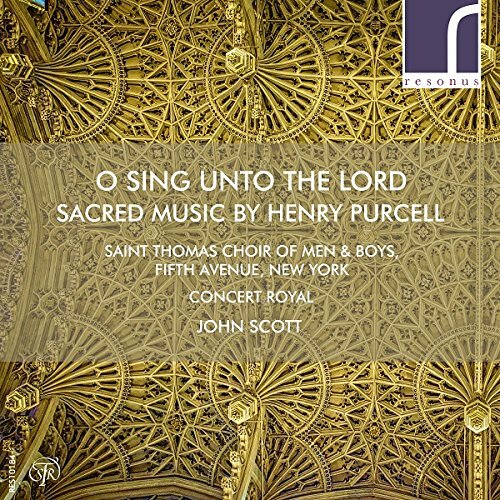 Resonus Classics continues its series mining the archives of the late John Scott and the choir of St Thomas's Church, Fifth Avenue, New York. 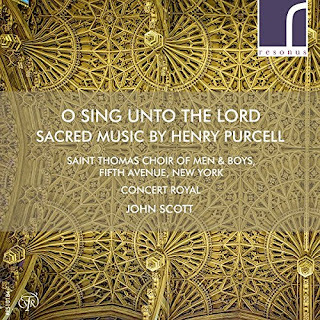 For this latest disc, Scott and the choir are joined by organist Frederick Teardo and Concert Royal for a programme of sacred music by Purcell including the anthems O sing unto the Lord, Remember not, Lord, O God, thou art my God, I was glad, and Hear my prayer plus the Evening Hymn with counter-tenor Eric Brenner, the Morning Hymn with treble Daniel DeVeau, Jehova, quam multi sung hostes mei, Te Deum in D major and Voluntary in G major. It is a handsome election which the choir originally recorded in 2010. The choir achieves and admirable firmness and dexterity in the Purcell, with the treble section notably fine. The choir has 25 trebleswith six altos, five tenors, and five basses. These substantial forces bring an admirable depth of tone to the music, but combined with a litheness and rhythmic fluidity which is completely engaging. This is supported by the supple rhythms of the Concert Royal. John Scott's gets a nicely graceful performance too, along with one of great technical security. Hear my prayer is as fine as anything you will hear on disc. Scott takes his turn at the organ for the Voluntary in G major. The disc finishes with the wonderfully grand Te Deum in D major complete with trumpet fanfares. If it came to simply the choral and instrumental contributions then I would have no question of recommending this disc wholeheartedly. But the verse anthems (and the Morning Hymn, and Evening Hymn) draw on the choir members for the various solos. The results are highly creditable, and make for engaging listening. But if you compare to Robert King's inestimable complete Purcell sacred music (where discs are available separately) then King has the edge when it comes to soloists. But this is a valuable record and an engaging recital, and a chance to hear Scott and his fine choir on peak form in Purcell. A snapshot to sit alongside other versions on the library shelf.